I woke up to frost a couple of days ago! And today, I was met with cold rain. Needless to say, and I don’t think anyone will argue with me, winter is still here! And curry is the cure to keeping you warm! 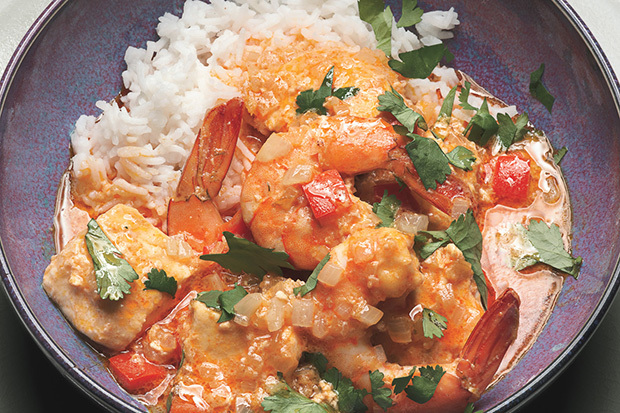 Here is a Thai curry recipe from Epicurious that calls for shrimp and halibut. Finely grate enough peel from 2 limes to measure 1 1/2 teaspoons. Squeeze enough juice from 2 limes to measure 2 tablespoons. Cut third lime into wedges. Heat vegetable oil in large saucepan over medium-high heat. Add chopped shallots, diced red bell pepper, and minced ginger; sautè until shallots are tender and peppers soften, about 5 minutes. Stir in curry paste, coconut milk, fish sauce, 1 1/2 teaspoons lime peel, and 2 tablespoons lime juice. Simmer gently, stirring often, about 5 minutes. Sprinkle fish and shrimp with salt and pepper. Add fish and shrimp to curry sauce. Return to very gentle simmer and cook just until fish and shrimp are opaque in center, 5 to 6 minutes. Season to taste with salt and pepper. Gently stir in cilantro and basil; serve with lime wedges.